Wind damages plants by breaking branches, blowing off, or shredding leaves and flowers. The constant back-and-forth motion of gusting wind can knock trees over, take down shrubs and wreak havoc on a plant’s root structure. In Marin, the winds blow over the hills and gust through low valleys like a wind tunnel. On the coast, wind plus fog and salt spray are intolerable for many plants. Wind affects plant transpiration – that is, it causes water to evaporate from a leaf’s surface more quickly than it can be replaced via the soil. A plant that is dried out is much more susceptible to damage and disease than one that is properly hydrated. There are many things that can be done to counteract the effects of wind and exposure. These include using wind resilient plants that bend instead of break, making structural changes to your garden to create windbreaks and barriers, making sure that windy areas are well watered and mulched, and pruning trees and large shrubs properly. Creating a windbreak can help buffer your garden from harsh winds. This is done using a combination of large trees or shrubs planted in a series of staggered rows that send wind flowing around and above. Windbreaks are most effective when space is not an issue and when they can be oriented at a right angle to the prevailing wind. A smaller scale version of a windbreak is a wind screen. The best wind screens don’t completely block the wind, but temper it by allowing some air through. Leafy plants make ideal wind screens, but other more permanent things can also be used in groups: a section of fence, a wall or a pergola with one side closed. The barrier should be porous (about two-thirds solid to one-third openings or holes) and at right angles to the prevailing wind direction. Here in Marin, this generally means putting something to the north or west of whatever you would like to protect. Even a small section of hedge, wall or fence can create wind-free pockets that can shelter a bench or protect a special tree. A large, strategically placed stone is beautiful and can create a leeward buffer behind which you can place plants. Remember, though, that the wind will blow more strongly along either side, like water going past a rock in a stream. So, if you’re thinking about making any large-scale changes to your garden, consider your options carefully and dis-cuss them fully with your contractor, designer or landscape architect. Olive trees can make a strong design statement in a windy landscape. Photo by Marybeth Kampman. Water management is critical in windy areas. Plants have to work even harder at maintaining hydration, so keep soil evenly moist around plants in exposed area. This may include adding an extra inch or two of mulch, or installing an irrigation system with a water sensor. The plants that are most successful in the wind are those that will sway or bend rather than snap. Often these plants have foliage that is needle-like. Broadleaf (plants with large leaves) can shred or tear. Even so, there are many plants that work well in windy conditions. Nothing looks more picturesque framing an ocean view than the Monterey cypress (Cupressus macrocarpa). In fact this large tree does best when subjected to cool coastal breezes. 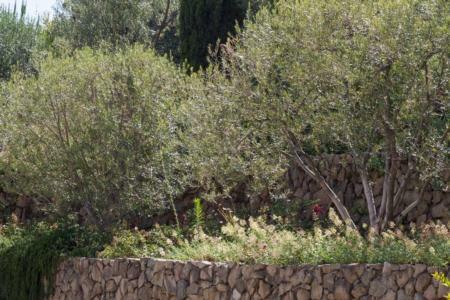 For the more Mediterranean garden a combination of olive trees (Olea europaea) and a purple variety of hopseed (Dodanaea viscosa ‘Purpurea’) would look lovely with the larger California native fernleaf Catalina ironwood (Lyonothamnus floribundus asplenifolius). Ceanothus, whether tree form, shrub or groundcover, is a good choice for windy locations. Photo by Marybeth Kampman. Another nice native tree/shrub combination is the strawberry tree (Arbutus unedo) with its beautiful bark, flowers and fruit or the larger California lilac (Ceanothus). 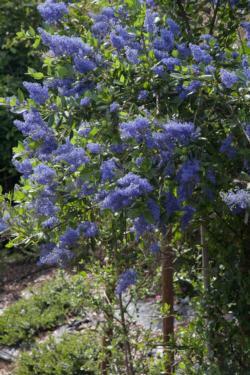 Ceanothus ‘Ray Hart-man’ is larger scale, while the smaller Ceanothus ‘Concha,’ has beautiful dark green leaves and deep purple flowers. Ceanothus griseus ‘Louis Edmunds’ works beautifully as a large-scale groundcover. Hakea resembles a pine but can be trained into a beautiful, gnarled tree form. Another similar looking plant is the silky net bush (Calothamnus villosus), which has stiff arms with orange tips that seem to glow in the sun. Either would look very nice next to an Australian fuchsia (Correa). For those who prefer a more traditional look, the rugosa rose is extremely tough (Rosa rugosa ‘Alba,’ which is white, or the ‘Hansa’ which is purplish-red) and would look stunning with the native salal (Gaultheria shallon) planted nearby. Salal prefers shade or part shade, but will grow in the sun, just smaller. Many people think of palm trees as wind tolerant -- and many are. Just be sure to double check the specific variety before counting on this. Some gorgeous palms (and palm-like plants) have softer leaves that easily shred in windy conditions, like the traveller’s palm, Ravenala madagas-cariensis. These are best used in locations where they can get more protection. Another issue to consider with palms and the wind is plant litter. It’s important to make sure all your plants are properly pruned and maintained, but especially palms so they don’t become a nuisance or hazard. Junipers (Juniperus) are oldies but goodies for your windy garden. There are numerous new cul-tivars that stay relatively small and have foliage that looks delicate. Juniperus squamata ‘Blue Star’ has silver-blue foliage and only grows three-feet tall and wide. It pairs well with the strappy leaves of a smaller New Zealand flax (Phormium) or a butterfly agave (Agave potatorum). Wonderfully scented lavender (Lavendula augustifolia) looks great planted in a grid alternating with lavender cotton (Santolina chamaecyparissus) or at the foot of large shrubs with unsightly “feet” showing. Euphorbia ‘Silver Swan’ is a stunning variegated plant that looks good with the magenta-flowering Salvia nemorosa ‘Amethyst’ or with red hot poker (Kniphofia ‘Little Maid’). Other good salvias include Salvia leucophylla, mellifera and apiana. A good native combination would be low-growing Ceanothus gloriosus ‘Anchor Bay’ with sandhill sage (Artemisia pycnocephala) and hair grass (Deschampsia caespitosa ‘Shell Beach’). Pacific Coast iris (Iris douglasiana) would bring a lovely spot of color to the combination. There are lots of ornamental and native grasses that tolerate wind and have the added bonus of leaves not getting torn, plus they look good swaying in the wind. Try sea oats (Chasmanthium latifolium), California oatgrass (Danthonia californica) or Festuca californica ‘Horse Mountain Green’ with its upright form and unusual foliage. Bougainvillea are old-school vines that, while frost tender, are grown widely and can thrive here in full sun. There are new smaller and thornless varieties such as Bougainvillea ‘Singapore Pink’ or ‘Singapore White.’ Another lush, tropical-looking, wind tolerant vine is cape honeysuckle (Tecoma capensis) with brilliant orange-red flowers. An interesting succulent that works well in the wind is blue chalksticks or blue finger (Senecio mandraliscae).